The Ram 1500 may be the third best-selling half-ton pickup truck in America, but it offers a combination of options that the Ford F-150, Chevy Silverado, GMC Sierra, Toyota Tundra, and Nissan Titan can’t match. Simply put, no other traditional half-ton pickup is available with adjustable air suspension, a turbodiesel engine, and side cargo boxes. The Ram EcoDiesel kicked off a wave of diesel-powered pickups and captured the 2015 Autobytel Truck of the Year award. The introduction of the slightly smaller Chevrolet Colorado and GMC Canyon Duramax, along with the larger Nissan Titan XD, bode well for the future. While diesel fuel is sometimes more expensive than regular unleaded gasoline—largely due to a heavier tax burden—it’s tough to argue with its added torque and better fuel economy. 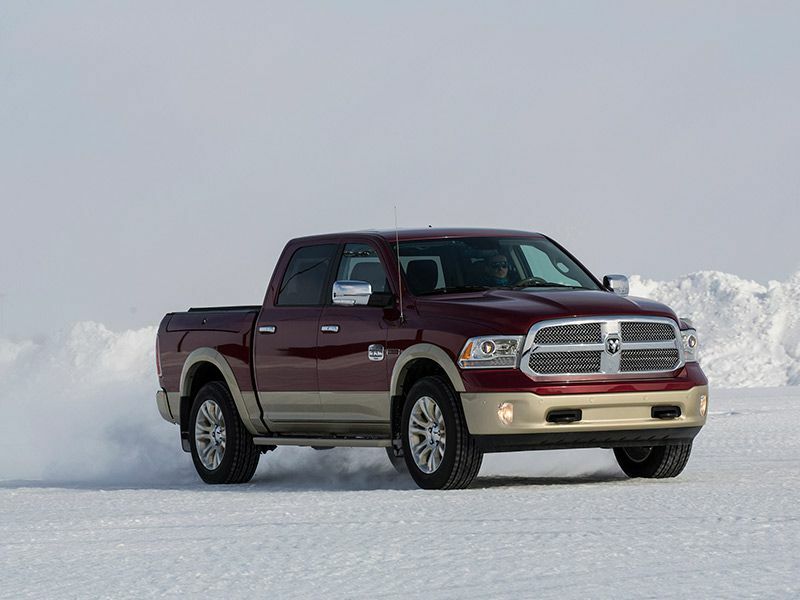 Read on for our full road test and review of the 2016 RAM 1500. Where Does the Laramie Longhorn Fit? 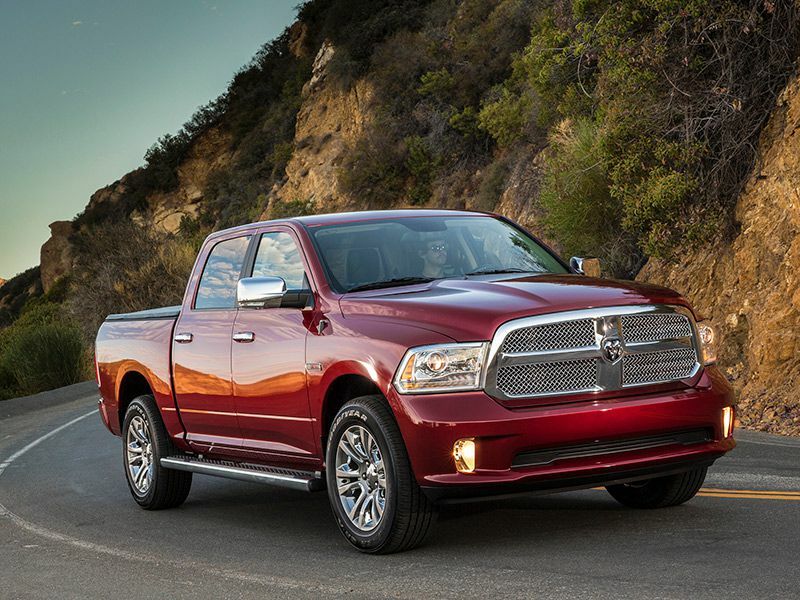 The Ram 1500 is offered in a plethora of trim levels, starting with the base Tradesman work truck at $26,145 and the Ram 1500 Express at $27,525 all the way through the off-road-ready Rebel at $43,270, the gorgeous Laramie Longhorn at $48,735, and range-topping Limited at $52,320. The price spread is huge, with MSRP doubling from base to Limited. We’ll dive into all the different Ram 1500 trim levels in another article. 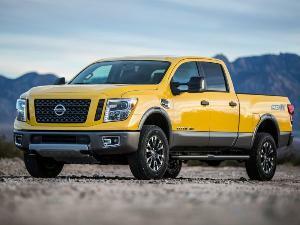 The new American luxury car is a high-end half-ton pickup. The Ram 1500 Laramie Longhorn faces off with the Ford F-150 King Ranch, Chevrolet Silverado 1500 High Country, GMC Sierra 1500 Denali, and the Toyota Tundra 1794 Edition. The 2016 Ram 1500 is available with a range of powertrains. The Laramie Longhorn’s standard 5.7-liter Hemi V8 cranks out 395 horsepower and 410 lb.-ft. of torque. While 89-octane mid-grade is recommended, 87-octane regular gasoline is acceptable. The Hemi can be equipped with a 6-speed TorqueFlite automatic or the 8-speed ZF TorqueFlite. The Ram 1500’s base engine is a FlexFuel 3.6-liter Pentastar V6 that produces 305 horsepower and 269 lb.-ft. pound of torque on 87-octane regular gasoline. The Pentastar is mated to an eight-speed Torqueflight automatic transmission. Our Laramie Longhorn 4X4 crew cab test truck was equipped with the optional 3.0-liter EcoDiesel V6, which delivers 240 horsepower and 420 lb.-ft. of torque on ultra low sulfur diesel. 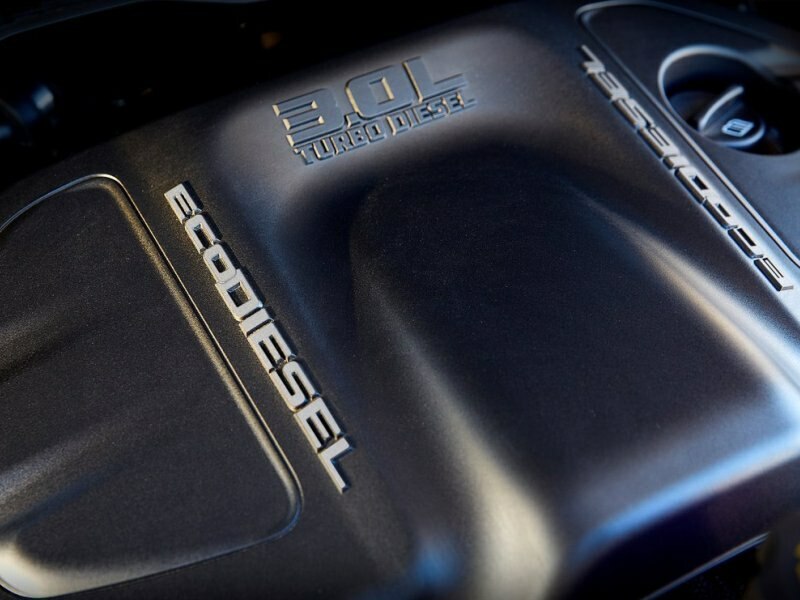 The EcoDiesel is paired with an 8-speed ZF TorqueFlite automatic transmission. If you need to haul and hold down the line on fuel costs, the EcoDiesel gets the nod. Driving range is enormous, with a standard 26-gallon fuel tank and optional 32-gallon tank. 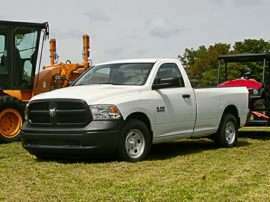 The EPA rates the thriftiest 2WD Ram 1500 EcoDiesel at 21 MPG city/29 MPG highway and most efficient 4WD EcoDiesel at 19/27. This compares favorably with the 2WD Pentastar at 17/25 and 4WD at 16/23, as well as the 2WD HEMI 8-speed at 15/28 and 4WD at 15/21. A 3.55:1 rear end is standard and a 3.92:1 is optional. The EcoDiesel is one of Ward’s 10 Best Engines for 2016 and is compatible with B20 biodiesel fuel. We had no problem hitting the official specs. Autobytel’s 0-60 mph test with a 4x4 Ram 1500 EcoDiesel QuadCab produced a best time of 8.5 seconds. 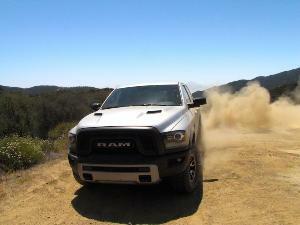 By comparison, our test of a Hemi-equipped 4X4 Quad Cab hit 60 mph in 6.9 seconds. 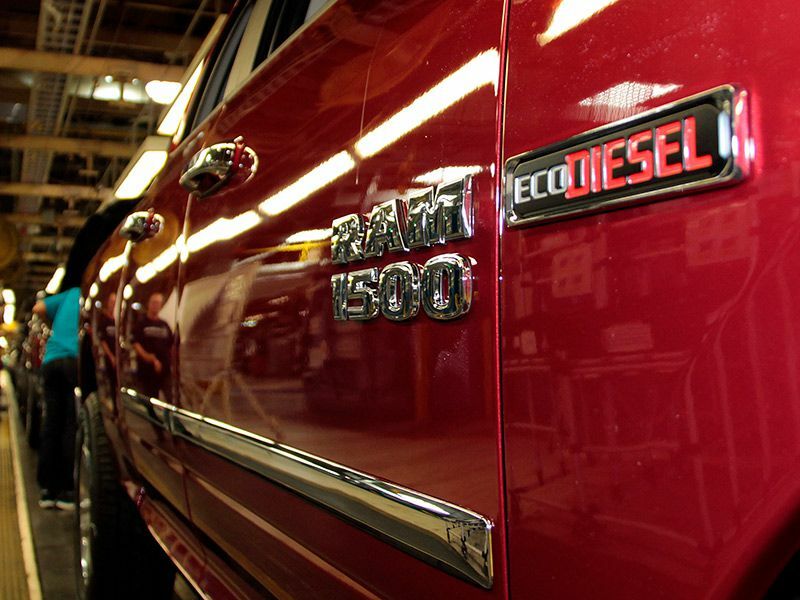 While you may prefer the Hemi off the line, the EcoDiesel shines on the open road. The Ram 1500 features coil springs at each wheel, which delivers a notably smoother ride than the competition. The optional four-corner air suspension system is class-exclusive, as it automatically lowers the suspension at highway speeds to optimize fuel economy. Other suspension-height settings are dialed in from the dashboard. Entry/Exit mode drops the truck 2.1 inches from normal mode to allow easy access for passengers and to ease cargo loading chores. (This feature came in handy while driving my mother-in-law to a family gathering.) Off Road 1 and 2 settings raise the suspension when traveling off the beaten path. Fitted with a 6-foot, 4-inch box, the 4X4 Crew Cab, fitted with 275/60R-20 tires and at normal ride height, has a ground clearance of 9.4 inches. Off Road 1 raises it to 10.6 inches, and Off-Road 2 take it up to 11.4 inches. Raising the suspension increases the approach, departure, and ramp break over angles, as well. 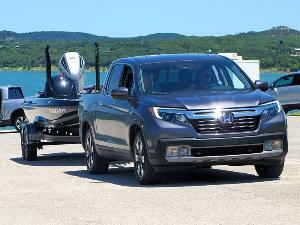 You won’t find equivalent technology on any other half-ton pickup truck. 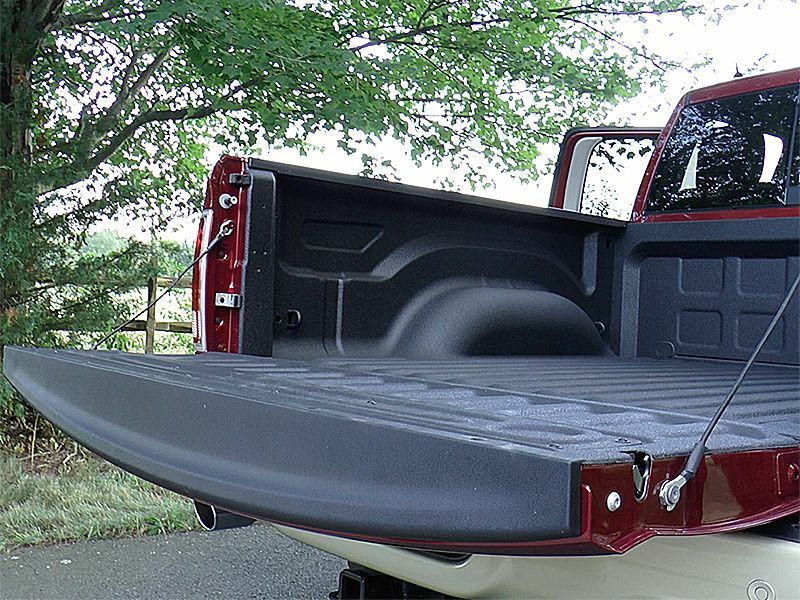 Every pickup truck manufacturer strives to include a little something special in their cargo beds to differentiate their trucks from the competition. Chevy has a side step bumper and Ford has a handle to help you climb into the bed. 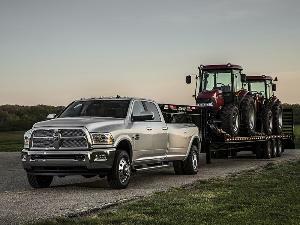 Ram one-ups the competition with the optional Ram Box Cargo Management system. With the Ram Box system you gain easily accessible storage along both sides of of the bed, with built-in drainage. The Ram Box option also includes tie downs, LED cargo box lighting, bed partitions, and a rear extender that allows you to carry 4x8 sheets of building material with the tailgate down. The Laramie Longhorn is available with a 5-foot, 7-inch box or a 6-foot, 4-inch one, both with a spray-in bedliner. The 4X4 EcoDiesel’s payload capacity is slightly over 1500 pounds, and the maximum towing capacity is 9790 pounds when the truck is properly equipped. 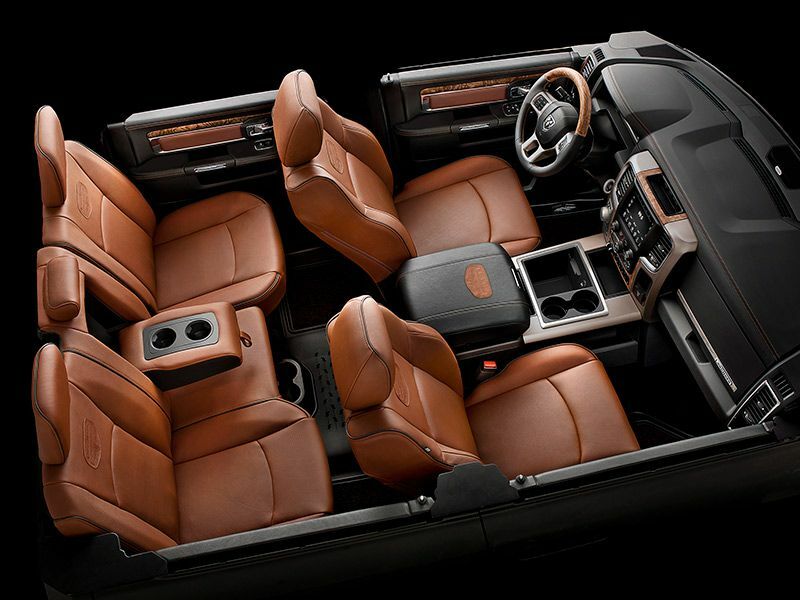 If you’re a pushover for luscious leather interiors with a western theme, the Laramie Longhorn is your new faithful steed. Fiat Chrysler’s interior designers have outdone themselves and the attention to detail is remarkable. It's like an ode to the American Old West. The supple and supportive front seats feature power lumbar support and heating. The distinctive wood and leather-wrapped steering wheel is heated as well. The crew cab provides oodles of room for the gang, the cupholders offer plenty of space for bottles of sarsaparilla, and there’s a herd of ports where you can hitch up and charge. The front seat literature pockets are designed with a saddlebag theme and the heavy-duty rubber floormats feature a barbed wire motif. Never have I been so sad to give up a pickup truck after a test. The Ram 1500 Laramie Longhorn is equipped with a comprehensive infotainment system and the subwoofer-equipped 9-speaker Alpine audio system gets the cab thumping. The 8.4-inch Uconnect touchscreen display supports Siri Eyes Free and features Garmin navigation, along with app compatibility (including Pandora and iHeartRadio) and all the connectivity you’ll ever need. There's a 115V outlet on the dash, a 12V outlet on the center console, and two USB ports inside the console. A rearview monitor is standard (as it should be on every truck), along with front and rear park assist. The one place the 2016 Ram 1500’s infotainment system falls short is in the lack of support for Apple CarPlay and Android Auto. That will likely arrive on 2017 models. 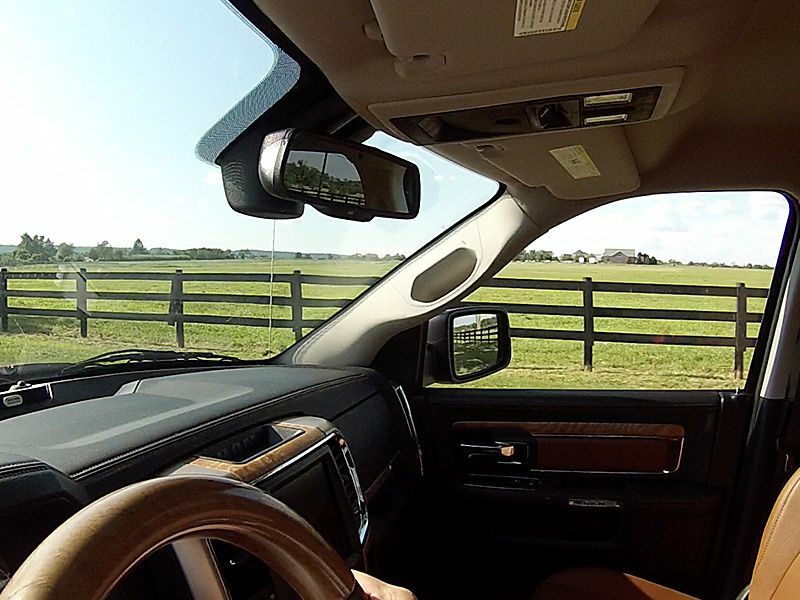 Slipping behind the wheel of the Laramie Longhorn puts you in a different state of mind. 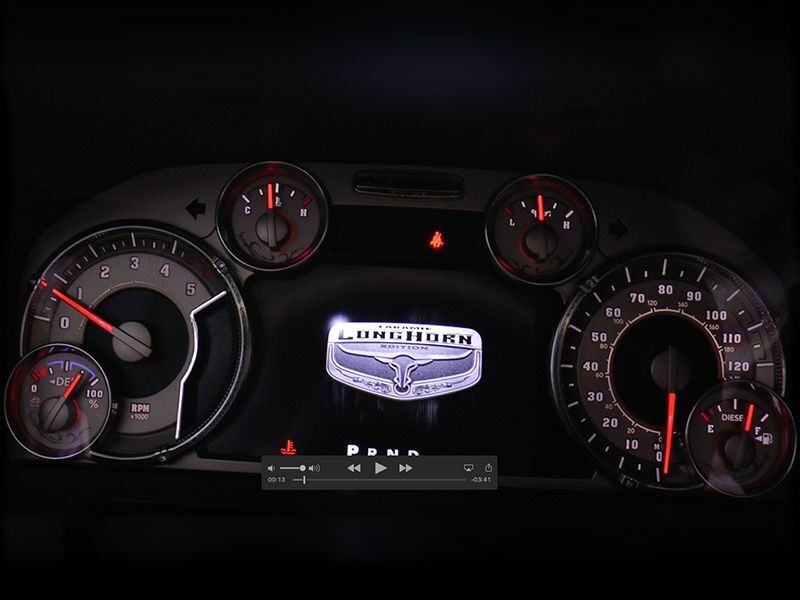 The dashboard blends Old West bezels with a high-tech customizable LCD display. The EcoDiesel is softer off the line than the Hemi, but it’s marvelous on the roll, where it matters the most. The coil-spring suspension delivers the sweetest ride I’ve experienced in a half-ton pickup. So how smooth is it? My entire family fell asleep on a long drive home. That’s never happened before with any truck I’ve tested. This is one seriously refined pickup. While some folks are wary of diesels in winter, they do just fine when you take the right precautions. The Ram 1500’s optional cold weather option group includes an engine block heater and a removable winter front grille cover. The engine block heater ensures a quick start on the coldest mornings and the grille cover is designed to maintain underhood temperatures throughout the day. The Ram 1500 has always been one of the biggest and boldest half-tons. Its aggressive looks take on a new level of class when the Laramie Longhorn trim level is checked. Upgrading from the Hemi engine to the EcoDiesel is a decision that should be made based on real world requirements. Take out a pencil and paper, write down your estimated mileage and fuel prices. Plug the numbers into a calculator to see how long it will take to justify the added cost. If you need to make the long haul with a full cabin and cargo while holding down fuel costs, the EcoDiesel gets the nod. The new Chevrolet Colorado and GMC Canyon are compelling choices for the efficiency-minded, as well. 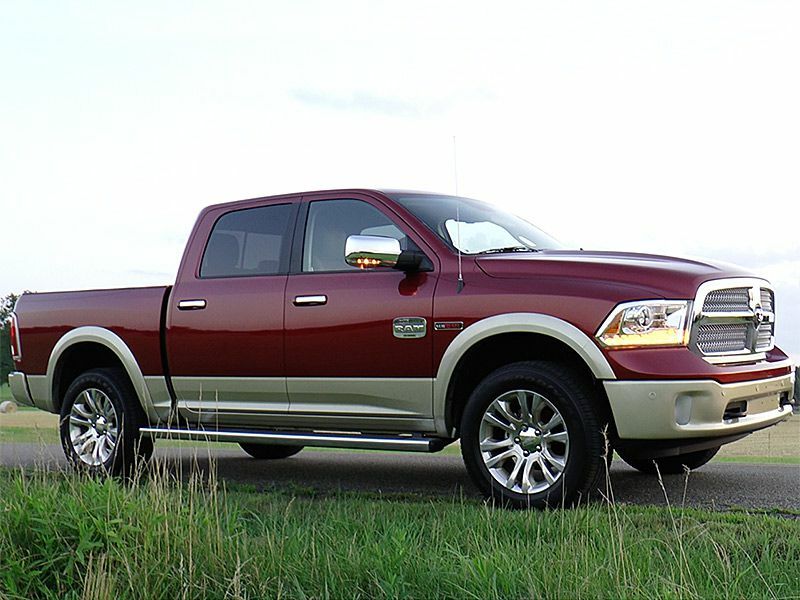 You'll want to weigh their smaller size and capacities against the Ram 1500 EcoDiesel. 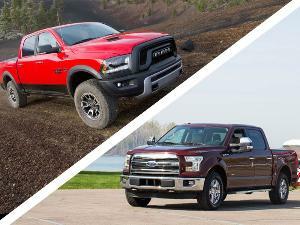 There's never been a better time to buy a diesel-powered pickup.